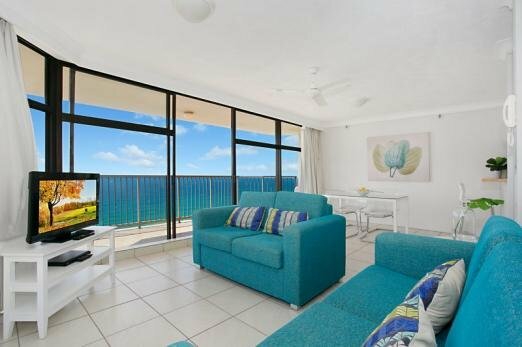 The imperial Surf is a fantastic two bedroom apartment with sensational ocean views down to Coolangatta. This unit is located on the 23rd floor and overlooks Surfers Paradise beaches and is a two minute walk to the heart of Surfers Paradise shops, bars & restaurants. The main bedroom has ocean views along with an ensuite & built in robes. The second bedroom also has ocean views & built in robes, each room has ceiling fans. The main bathroom has a separate bath & shower & there is also a separate laundry with a washing machine & dryer. The lounge includes a fold out sofa bed to accommodate an extra 2 people. There is also a large balcony with fantastic ocean views and a dining area. The complex has great resort facilities including an indoor/outdoor pool, spa, steam room & sauna. There is also a tennis court located in the complex along with bbq facilities. This secure resort also offers under ground parking for one car & is perfect for your next Gold Coast vacation.